First, they have a functional neuro-electronic interface able to provide coherent signals. That alone, unless I've missed something, is a major breakthrough. Second, they've been able to get individual neurons to self-organize to the point where they can cause observable behavior and respond to external stimuli. Third, they've not only shown that a small collection of neurons, on the order of 100,000, can learn, but they have been able to influence it's learning and behavior by chemically altering individual or small groups of neurons. Just the research avenues this allows are significant. The computational possibilities are astounding. The medical/enhancement possibilities this opens up are, no pun intended, mind-boggling. I have a healthy skepticism of some of the more out there claims of the singularity-ists, but this is not just a move in that direction, it is an olympic-sized leap. We do things a little different here in Arizona. Worked on a new roof today, and got about a fourth of it done. I'll do another fourth each weekend, and that should get it all done before it rains. OK, it's not really a new roof. It's just another of the odd things I've had to get used to here. For instance, there's no insulation in my house, except for a thin layer of fiberglass above the ceiling. Don't really need it, though in the summer it would probably help some. There's no screen on my back door, so at night we get the occasional moth or other flying pest, even a mosquito once in a while, if we leave the door open after dark. Most houses and even businesses are cooled by blowing air across a wet sponge. Works great until the humidity gets above 50%, which it does - with temperatures remaining in the high 90's and 100's - from late June through late August. And you have to spend a hundred bucks on new "pads" every four or five years, plus the annual ritual of cleaning winter's accumulated algae and cruft out of the pads and reservoir. Then there's the roof itself. Mine is just raw plywood. Sure, a lot of the fancy new houses those people from California are building have Spanish tile, but thats just for show. What keeps the rain out here is a giant rubber sheet over the roof. It comes in 5-gallon buckets and is applied with a regular paint roller. The buckets cost about $80 each (I'll be needing four of them), unless you buy the cheap stuff. And by cheap stuff, it means that it wears out in two or three years instead of five. Oh, and it's not as white. See, one of the big selling points is the reflectivity. Some of them even have titanium flakes in them to make them even more white and more reflective. It's probably enough to blind passing airplanes in a giant solar oven made from all those reflective roofs all over the city. So my new roof, or one five-gallon bucket's worth, took about an hour before breakfast to put on. And since we're expecting rain in six weeks, I need to stay on top of things like that. I'm one of those people that keeps their computer running 24/7 so I can just sit down and start working. My only in-use Windows computer, a laptop, hasn't been turned off for something like a year, except for reboots or when I am carrying it somewhere, like on vacation or something. I just shut it down, and I ain't going anywhere. Apple is so good at integrating all of their products and services, that a minor annoyance looks like a significant blunder. I’m damn near a Luddite when it comes to entertainment technology. I still have an old tube television, and next to it a 10-year old VHS player and a DVD player that I only bought after the first time I went to Blockbuster and found that the movie I wanted was not even available on VHS. So when I sign up for an iTunes account, it means that they’ve moved beyond the early adopters. The integration of iTunes with all of their products, and the nearly seamless wireless integration of all those products, is a powerful combination. The upgrades to iTV, the new rental feature of iTunes, and the bandwagon-jumping-on by all the major studios, make it something even I can’t ignore. I even did some back of the envelope math on eliminating or downgrading my cable TV service in favor if iTunes/iTV. The numbers aren’t there yet, and the movie/tv show selection is not there yet, but it’s coming. Jobs has been putting into place all the pieces needed for Apple to become an end to end supplier of entertainment hardware, software, and content. Apple stock is cheap right now, by the way. So, I signed up for iTunes to “buy” the free pilot episode of the new Terminator series. To do this, I had to sign up with all the credit card info needed to buy things, so now impulse buys are at my fingertips. When I was at the Terminator series page, I noticed there was an additional episode available for $1.99, but I didn’t buy it right away. After watching the pilot, I really did want to buy that other episode. Here’s where their blunder comes in. I was on my TV Shows page in iTunes, where I would watch the episode from. They’ve got the artwork, the description of the episode, etc., all nice and neat. A double click and the show is running. So I’m looking for where to click to go the the series page at the store. No such thing. I couldn’t get directly from my download back to the store page where I bought it, and where more purchases are available. So I went to the store, navigated to the page, and bought the episode, but it just didn’t feel like the Apple Way. In a Microsoft world, I never would have even bothered looking for such a thing. You can’t get the kind of integration in that world where being able to do it would even be a consideration. But Apple has already spoiled me to the point where I not only expect it, I’m kind of surprised and disappointed when it isn’t there. It violates something I think ought to be a rule for anyone selling anything online: if at all possible, your customers/users should never be more than one click away from someplace they can give you money. UPDATE: I found that there is a link afterall. If you're on the music side of iTunes, it's a lot more obvious. There's a little arrow by each of the song, artist, and album names. For TV shows, there is only an arrow by the episode name that takes you to the series page, but no arrow by the series name. And the arrow is next to the "TV-14" logo, so it looks like it is related to that. So, it's more of a one-time usability issue, affecting only newbies like me, rather than a marketing blunder. Interesting side note, I had VH-1's "Top 100 Songs of the 80's" on the other day, and kept saying to myself "boy, I wish I could get that song somewhere...". Duh! I ended up spending thirty bucks over the weekend. Yikes. So I'm in the bowels of the institutional-level financial software application, my small part in the production of which currently pays my mortgage, and I find that it simply blows itself up when it gets in a bad mood. It doesn't get into a bad mood often - in fact I have to intentionally stress it out, tease it mercilessly and egg it on in order to put it in a foul enough mood to snap back at me. This consists mostly of repeatedly telling it that it's a good for nothing lazy bum who will never amount to anything. Or something like that. Turns out, that even with this relentless badgering, the chance of it getting into a sufficient funk is about one in a million, literally. Which means I can make it reliably happen at will in about 3 seconds. Literally. I'm working in the bowels of this app (which is probably enough in itself to make anyone cranky). Its the engine of the whole thing, a framework that simply everything else depends on, so it's pretty important. This is a highly multi-threaded piece of work, which means, in normal-people talk, that lots and lots of parts are all whizzing around at the same time, rather than working in a nice polite single file the way computers are meant to operate. The normal way to find a bug is to isolate the suspected parts until only one part is left and it still makes things blow up. Then that's the aprt to fix or replace. The problem is that with all this multi-threadedness, all those parts whizzing around each other, that it is usually the places where the parts meet that causes the problems. One gear can spin by itself forever without grease, but mesh two of them together, and sparks fly. This makes the divide and conquer approach tricky at best. So, anyways, now, I've got the engine laying around in pieces, its vital parts spread out on the garage floor among little globs of grease and puddles of oil and those damn extra screws that I can't remember where they came from. And I finally see the problem. It's like a little grain of sand that's been cutting grooves in the crankshaft. That says that if x is bigger than y, do some stuff - "stuff" in this case being to break x into smaller pieces. But these damn computers are far, far pickier than that. Really, it's like trying to guide a three year old in doing brain surgery via a game of Simon Says. See, x has to be smaller than y, so telling it to do something if x is bigger than y is not good enough. What if x is the same size as y? Hmm? Simon says BOOM. Oy vey! One damn character, and it took a day and a half to find it. And I wrote that line myself not a week ago. The initial problem was that the thing would blow up if the value of x was just any old kind of wrong. All my "fix" did was to make it blow up only when the value of x was one very specific kind of wrong, which only made it harder to find. The worst bit is that this is part of a fairly standard way of normalizing data (which means basically making it the right size to stuff into where it needs to go), and I should have known in my sleep that that extra little equal sign needed to be there. Now I've got to put all the parts back together - which is why I'm writing about it instead of doing it... I swear, if there's any screws left over, I'm gonna start drinking again. The High Frontier - "Revolution Through Competition"
A real hero left this world last week. The good news is she's been blogging about it, and now she's back home safely. I've added Anousheh Ansari to my blogroll. She fled Iran in 1979 when the Ayatollahs turned it into a place explicitly and irredeemably hostile to people with her values, educated herself - in the best Western tradition - made a few billion dollars, and is now at the forefront of the exploding private space industry. That she paid her way up to the ISS as the third civilian tourist is interesting. What makes her more than another rich tourist is her ambition to make what she did profitable to private entrepreneurs, and thus possible for the rest of us. She funded the X-Prize to the tune of $10 million (yes, that's her name on the "Ansari X-Prize" for spaceflight), and intends to start her own fleet of ships in the next few years. It's been two years since the X-Prize was claimed, and the developments since have been mind-boggling. A commercial spaceport is already being built in New Mexico, a private spaceport is being planned by Jeff Bezos in Texas, and many companies are competing for business in the varous niches of this infant industry, most notably Virgin Galactic (watch the movie), who have just recently announced that their World Headquarters will be located at the New Mexico port. This explosion began when, in an amazing and rare fit of common sense, the federal government passed a bill which, for the most part, says that they'll do the one thing anybody really ever needs from government, just get the hell out of the way! The bill does that, at least to the extent that such is possible from government; it still leaves plenty of hooks in the industry, sure to be firmly set once there is some booty to be extorted. The NM port is built by the state, but it could have been built by any of the major players. Branson probably could have put up the entire $200 million from his petty cash - and kept all the potential profit such a thing will likely generate. But it at least provides the first physical nexus for much of this activity. (tip: buy real estate around Las Cruces, Truth or Consequences, and Hatch, NM, now), and it's effects in the long run will be little more than a footnote. Even the ISS will probably be obsolete before it is even finished, a dinosaur floating aimlessly above a world that has passed it by. This is the biggest thing since fish grew legs. This is a civilization changing time. The first flights, trivial as they may be in their purpose, will provide experience to those participating, they'll provide markets for vendors and other secondary industries, they'll provide infrastructure both on the ground and in orbit to support more meaningful and more ambitious enterprise, and they'll provide a mindset in the average person that space is just another place to visit, work, and even live in. As long as, that is, the feds and other governments do indeed stay the hell out of the way, at least until it's too late for them to stop it all. And, even more importantly, while there's people like Ansari, Branson, Rutan, Binnie, Melville, Diamandis, Bezos, Allen, and the thousands of others who have the vision, drive, skills, and resources to make it happen. What's the first thing a tourist does when he is away from home and seeing things that, while maybe mundane to those who see them everday, are things he may have never seen before? He starts taking pictures. Pictures are souvenirs, reminders of a place he may never get to experience again. They are also a way to share those experiences with others who might not get to see them for themselves. But they also serve another function. They say "I was here". They don't leave a mark on the place itself, but they serve to retain a little piece of the place, to mark the place in the tourist's memory as something he owned, if only in his experience and for a fleeting moment. This is one of the most glorious sunsets I've ver seen. No, I wasn't there, I will likely never be there and never have an opportunity to take such a profound picture myself. It's not such a spectacular sunset in itself - there's no dramatic colors, except for maybe the dusky red of the sky itself. There's no dramatic rays of light through the clouds, or shimering oblongation of the sun as it's light travels through miles of rippling atmosphere. But this picture is dramatic. It says "We Were Here". And not only that, it says that we had the time, the resources, and the interest to stop and look around - to look up from the business at hand and enjoy the once in a lifetime vista that had nothing in itself to do with the business at hand. It's important precisely because it doesn't matter - it doesn't further the mission nor is the expense and time justified by the reason that we were there in the first place. It's profoundly important because it gives us all a little piece of someplace we may never be ourselves, but may be an everyday site for our descendants. No human took this picture. No human has yet set foot in this place where such wonders can be found. But it was the human mind that made this picture possible. And if we can send our automated rover to this place and have it sep back and take silly irrelevant pictures like any other tourist, it won't be long before the real tourists will be there, in their Hawaiian shirts and sandals, clumsily stumbling over the rocks and dunes while oohing and aahing over the everday sights unimaginable to them in their homes today. 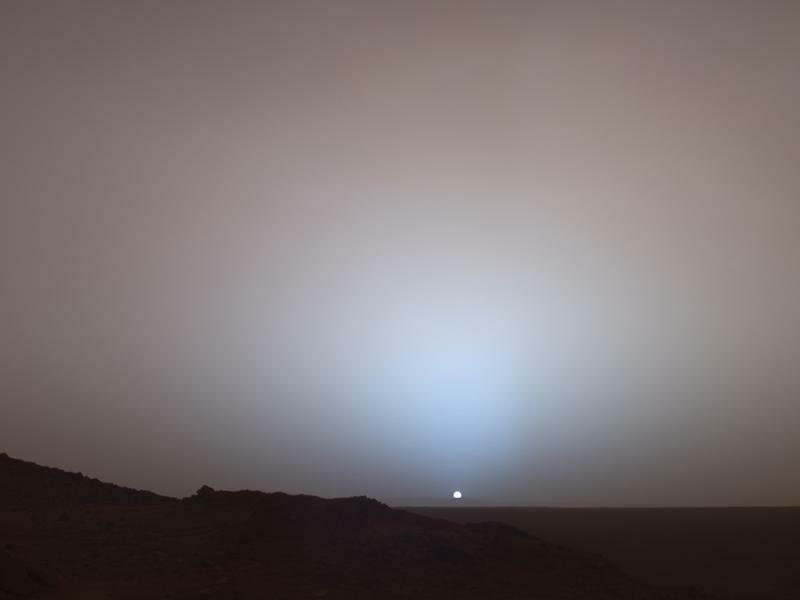 This picture is of a sunset on Mars. We're heading out, folks, and we won't be looking back except for the occasional picture back at that ever shrinking bright disk behind us that marks the place where we were born. The Speculist has the latest edition of the Carnival of Tomorrow. It's a rundown of some of the latest in Advancement Tech. (Of course, they don't call it "Advancement Tech" - yet. Nobody does, but they will...). Be sure to click to the main page and scroll down past the Carnival to the article on a new twist on solar power. A 3-foot parabolic reflector that melts aluminum, and predictions of a new age of steam power. Fascinating, and very promising. The founders of Intel both have their own laws now. Gordon Moore is famous for his law about the capacity and speed of computers doubling every 18 months, a law which has held up remarkably well for a long time. "Technology will always win. You can delay technology by legal interference, but technology will flow around legal barriers". I whole-heartedly agree. And though I might say that I'm here to help it, the truth is, it doesn't need my help. This blog has a long political "heritage", if you want to call it that. But advancement is the antithesis of politics. I'm here to talk about more, so much more, than politics. Things that will make politics a distant, slightly odd, memory. Technology is number three in my "big four" topics. It, like all the others, has ramifications for the other three. I'll be listing, as much for my own benefit as yours, those areas of technology - I'll call them "Advancement Tech" - that I think pertain to the other three in ways that have the potential to advance the human race in ways unimaginable to us now. All of those I list pertain to each area. I'll post them in a series of four articles over the next week or so, the next three each pertaining to one of the areas of Life, Intelligence, and Freedom. This is just a catalog, a way to organize a much larger discussion that will be ongoing here, and so I won't explore any of them in depth here. But these are the areas to watch, both to keep up with the cutting edge of human advancement and to be alert to emerging business and investment opportunities. There are a few areas of technology that are so broad, or so fundamental to other areas, that I can't fit them into any of the other three categories. So they'll just be here in the Technology category, but they have application to all four aspects of Human Advancement. Jet airplanes first made their appearance at the end of WWII. For decadees, they were the exclusive domain of the military. What came to be known as the jet age didn't start until the 60's, when commercial aviation expanded the scope of jet airplane use to the masses. Today will begin the space age. Appollo ushered in an era of limited government run space experimentation, but no real space age. A novelty, not an everyday reality. If all goes well today in the Mojave desert - and all indications are that it will - private, commercial spaceflight will be a reality. Good luck Burt Rutan and the as yet unnamed pilot who will be flying today. Heroes all.